Hanger steak, sometimes known as the “butcher’s cut,” is exceptionally tender and beefy. 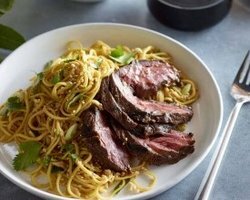 If you can’t find it, flank steak or the super-thin skirt steak make good alternatives. The sesame-scented noodles can be prepared hours ahead apart from the finishing touches. Pair with your favorite Temecula Valley Cabernet Sauvignon or Cabernet Franc. Whisk the marinade ingredients together in a small bowl. Put the meat in a non-reactive container, add the marinade and turn to coat well. Cover and refrigerate for 4 to 12 hours. Bring to room temperature before grilling. Prepare the sesame scallion noodles: In a large bowl, whisk together the sesame oil, soy sauce, chili oil, balsamic vinegar, rice vinegar, sugar, garlic, and salt. Bring a large pot of salted water to a boil over high heat. Add the noodles and boil until just tender. (Check package directions for recommended cooking time.) Drain in a sieve and immediately rinse under cold running water. Drain again well, then add to the large bowl. Toss gently with your hands to coat the noodles evenly with the dressing. Let rest at room temperature for 1 hour to absorb the dressing, tossing occasionally. Toast the sesame seed in a small dry skillet over medium heat until lightly colored and fragrant, about 5 minutes. Let cool. Prepare a hot charcoal fire. Grill the meat over direct heat, turning as needed to brown nicely without charring. Hanger, flank, and skirt steak are best when cooked rare or medium-rare; for medium-rare, figure about 10 minutes for hanger or flank steak, about 7 minutes for skirt steak. Let meat rest 5 minutes to allow juices to settle, then slice against the grain. Just before serving, add the sesame seed, scallion, cilantro, and peanuts to the noodles and toss gently. Taste for salt, then divide meat and noodles among individual dinner plates or serve family style.